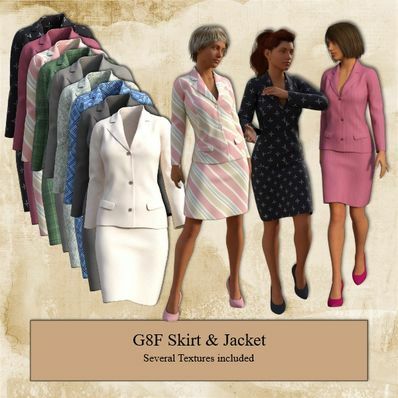 Skirt & Jacket for Genesis 8 Female for use in Daz Studio 4.8. Stunning professional office suit! Hope you are better. Thank you! This will suit Mabel fine, I think. Thank you very much! Thank you so much for this amazing outfit!! Wonderful Skirt and Jacket. Thank you so much! Wow! I really love this one. Nice work as usual. You always do a good job with your outfits! Thank you. I appreciate the work you put into your products! This will come in "handy" on so many occasions. I have been looking for a set like this so thanks so much!! Timeless look, thank you. Sorry to hear you were unwell, and hope you are fully recovered. WOW... such a lovely outfit... THANK YOU! Very nice outfit! Thank you! Looks fantastic, thank you for sharing these, I appreciate your generosity.. This is very upscale office wear or for any professional female. Very much appreciate it. Thanks!! Thank you for your continued generosity! Love your products! Lovely as always - thank you for all of these, Wendy! Classy design, good taste, as always. Love this. Excellent job - thank you very much! Wonderful. Thank you very much! wonderful work as always! thanks for your generosity! Merci pour ce tailleur élégant.